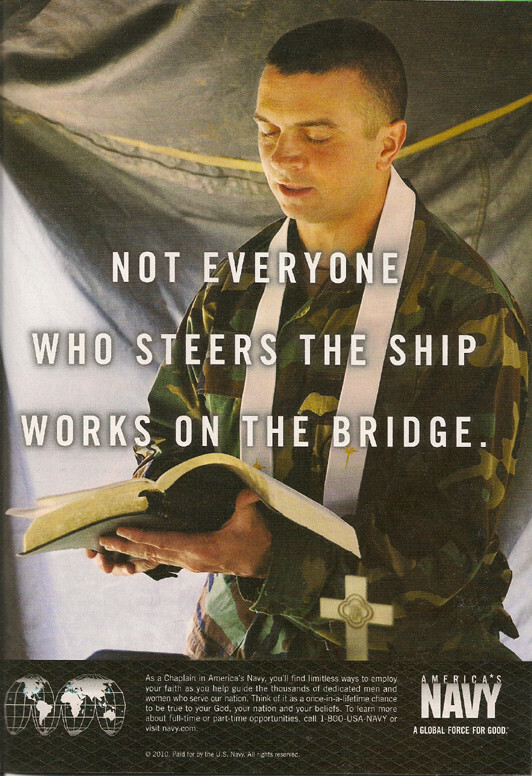 "As a chaplain in the Navy, you'll find limitless ways to employ your faith and you guide thousands of dedicated men and women who serve our nation. Think of it as a once-in-a-lifetime chance to serve your God, your nation, and your beliefs. To learn more about full-time or part-time opportunities, call 1-800-USA-NAVY or visit Navy.com." What blatant proof that there is promotion of Christianity over other religions (or non-religion) in the military. Your god and your beliefs? This calls for evangelizing, plain and simple. What about the dedicated non-christian men and women who serve our nation? Is this a call to convert their sad souls? Why would I, as a taxpaying U.S. citizen, want to help pay the salary of someone who is proselytizing while working in a government setting. It violates separation of church and state. The goal of the chaplain should be to help the soldier according to the soldier's own belief system, whether that be Islam, Hinduism, Christianity, Wicca, or any other choice, including the non-belief of atheism. Perhaps there are corresponding ads in magazines of other religions, I don't know. I'd like to see a Muslim, with the Quran in hand and star and crescent symbols in the photo, with the same text underneath. I bet that doesn't exist. Yeah, that is totally unacceptable. It just goes to show that the men in charge of this country are mostly Christians. Conservative, Evangelical Christians. The dangerous kind. We're screwed. You know, I was never really that thankful to be a Canadian until I became an Atheist and saw all the religous propaganda in the States. I agree Patrick when I see all the problems that religion creates in that country I too get reminded how good we have it here. As if the list of reasons not to join the Navy weren't long enough. Ironically, someone on this site awhile back stated an interesting statistic. Military personnel have a higher percentage of atheists/agnostics than the civilian population. War is a religious idea. You can't separate the two. Stalin was an atheist? Not really. He was an ideologue that formed his own "religion". The U.S. declared a holy war against the USSR. I don't believe the stats that say military personnel have a higher percentage of atheists/agnostics. Those in control of the military are bible thumpers. In the Mid-East, this could cause a war of annihilation because of religious tribalism. Why doesn't the army just use psychologists? I agree...the chaplain could and should be replaced by a therapist, and take the religious component out of the position altogether. These folks need someone to talk to, and not feed them the bull that comes with religion.